While we may not often consider our bathroom lighting as a major design element or measure of hospitality in our homes, lighting plays a crucial role in making our guests feel at home. As you entertain throughout the year, you’ll want to prepare a guest bedroom and bathroom for friends or family who may want to stay the night in your home. Although it may not sound like much, a handful of accessory updates to your bathroom can make any guest feel right at home in your space. These finishing touches not only tie your bathroom design elements together in style, but also make your guests feel comfortable and welcome. While we may not often consider our bathroom lighting as a major design element or measure of hospitality in our homes, lighting plays a crucial role in making our guests feel at home. Replace harsh mirror lights with dimmers that can be adjusted to ideal lighting settings that are comfortable for any time of day. With this, your guests will appreciate the ability to customize their lighting as they start the day or get ready for bed. Even though a towel warmer is far from being a necessity, this added touch of luxury in your guest bathroom will make any overnight guest feel right at home. There is a variety of brands to choose from when selecting the right one for your bathroom, and your guests will appreciate the warmth and luxury of this hospitable accessory in your home. We often consider these smaller elements of our bathrooms to be simple parts of the decor, but small suited accessories can have a major impact on making your guests feel at home. By providing them with soap dishes, toothbrush holders, and accessory dishes, they will always have a place to put everything that they need away for the night. Providing your guests with a place for everything can not only make them feel at home, but also keep your space neat and tidy during their stay. Utilize towel bars and robe hooks as stylish but highly functional pieces for your guests to hang used robes and towels to dry while staying in your home. Although you may not think much of your drain as a measure of hospitality for overnight guests, decorative drains are a stylish way to maintain the integrity of your shower and sink to keep them looking great and working well for guests during their stay. Use them as finishing touches to accessorize your bathroom while keeping your sinks and showers clean throughout the year. 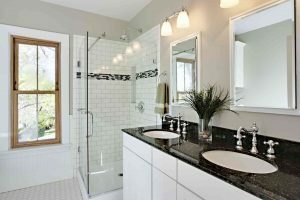 No matter which type of bathroom accessories you choose, WalterWorks Hardware has the expertise and supplies you need. We are well known through the Maryland, Washington, D.C., and northern Virginia area for our fantastic hardware and incomparable knowledge. For more information, please give us a call at (410) 263-9711 or contact us online. For more tips on choosing hardware for your home, follow us on Facebook, Twitter, LinkedIn, Houzz, Google+, and Pinterest. This entry was posted on Friday, January 19th, 2018 at 9:44 am. Both comments and pings are currently closed.